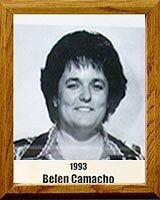 When Camacho was a kid there was no girls’ softball organization in Tucson; but there was a women’s team. Belen was hanging around the ball diamond one day when the adult team happened to be in desperate need of a catcher. She said her career began then and there, and it didn’t matter that she was wearing a good skirt. Belen was 13 years old. She played for 22 years. Belen coached underprivileged kids, crusaded for better opportunities for all young people, organized benefits for friends in need, ran a league and a state organization and was a half fame mother and wife at the same time. Friends remember her as a legend, a totally unselfish ballplayer, a great catcher, exceptional hitter, and most of all a lady who loved the game and put her heart into it.